The Mozilla Application Suite allows the user to customize the colour of hyperlinks. This setting also affects email and newsgroup messages. However, because it is a browser setting, the options panel for it is not in Mozilla Thunderbird. Once again, this is one of those things that you can change in Thunderbird, through hidden settings. The best way to do it, is using the AboutConfig extension, who’s function will be part of the upcoming Thunderbird 1.5. 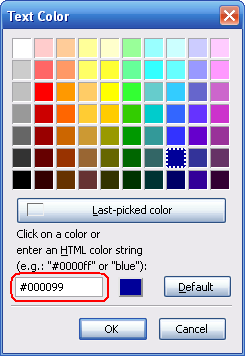 Pick the colour you want to use, and copy the HTML colour string, at the bottom. Now open AboutConfig [Tools -> about:config], and look for the setting browser.anchor_color. Double-click on it, and change the value to the HTML colour string you copied earlier. Click OK, close the about:config window, and you’re done. If you ever want to change the setting back to the default, right-click on the setting in AboutConfig, and select Reset. You can also change these settings using a user.js file, as described here. sounds great, thanks alot for the informatioms, I will try it out. I will try out to. Thx. © 2019 Chris Ilias. All rights reserved.